In this project, you create the core features of a shopping cart. To get a clear idea of how the project works, take a look at the following use case: Hanif needs to buy some teabags for his mobile café. He goes to a popular online shop that was created by an owner of this very book. Hanif does not have a user account on the Web site but starts shopping anyway. He clicks the Beverages category and sees the list of teabags. He clicks the Buy link and is taken to another page, where he can choose the quantity. He selects 10 boxes of teabags and adds them to his shopping cart. The page now refreshes, and he sees the contents of his shopping cart. Hanif then buys coffee, and his cart is updated again. Hanif realizes he does not need the coffee after all, so he clicks the X link to delete the coffee from his cart. Hanif finishes choosing items and clicks the Go to the Checkout link. He is prompted for his address, which he fills in, and is taken to the payment screen. John can choose to pay with PayPal or by check. John clicks the PayPal button and taken to the PayPal payment screen at paypal.com, where he pays for the order. Sangida needs some teabags, too. Sangida already has an account on the site, so she logs in. She adds the items she needs to her cart and clicks the Go to the Checkout link. At the address page, she can choose between a new address and the address stored with her user account. She chooses the account address and is taken to the payment screen. Sangida chooses to pay by check and is given instructions about where to send the check and to whom to make it payable. Always check and calculate your network security at http://subnet-calculator.org for free. ShiShir runs the Web site and wants to see all current orders. He logs in with his administrator username and password and is provided with a list of orders. ShiShir looks at each item, packages the order, and writes the address on the parcel. To confirm the completion of the order, ShiShir clicks the Confirm Payment link. The order is now complete. The shopping cart you build in this chapter satisfies all of the features discussed in the preceding use case, but there is still a huge scope for development. Shopping carts can become huge and complex systems, and an entire book would do the subject of building shopping carts justice. This project will provide a solid foundation in which you can continue to build in extra features. The database you will create is shown in Figure 1. 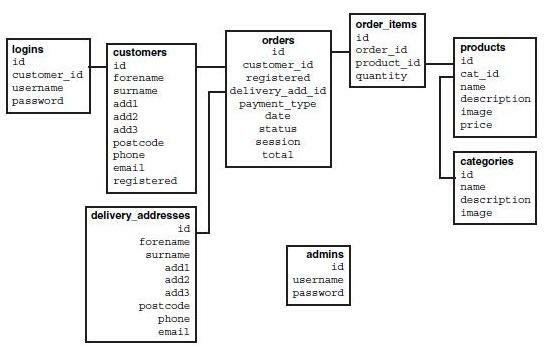 FIGURE 1-1 the database schema revolves around the main orders table. This entire project fundamentally hinges on orders stored in the orders table. This table relates to the customers (contains registered customer address details) and delivery_addresses (contains unregistered and alternative addresses) tables. Each product (stored in the products table) in the order is stored in the order_items table. Other tables include logins (stores the registered user’s login details), categories (contains the categories that the products are part of), and admins (stores administrator login details). 0 The user is still adding items to her shopping cart. 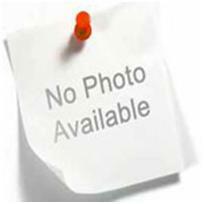 1 The user has entered her address. 2 The user has paid for the item. 10 The administrator has confirmed the transaction and sent the item. With a solid set of tables ready to go, add some sample data to get started. Remember, do not fill in a number in the id column; this is handled by auto_increment. Feel free to add your own sample data, or use the suggested information. Make sure you match the customer_id field to the id field in the customers table. One of the challenges in creating a shopping cart is dealing with both registered and unregistered users. For registered users, there is no problem because, when adding information to the tables, you can use their IDs to track them. The challenge arises with unregistered users. How do you track them? The solution is to use session IDs. When the user loads the first page with the session_start() function, a special session ID is generated. This ID is unique to that specific user and tracks which session variables are assigned to which user visiting the site. Although you have not referred to the session ID before, in this project you will use the session ID extensively. Every time a user visits the shopping cart and adds his first item, an order is added to the orders table. For registered users, the user’s id is added to the customer_id field in the table. For unregistered users, the unique session id is added to the session field. When this order has been added to the table, a session variable called SESS_ORDERNUM is created with the id of the order. SESS_ORDERNUM can now be used to track the order’s progress throughout the site. To get started, build the usual configuration file that stores generic information about the site. 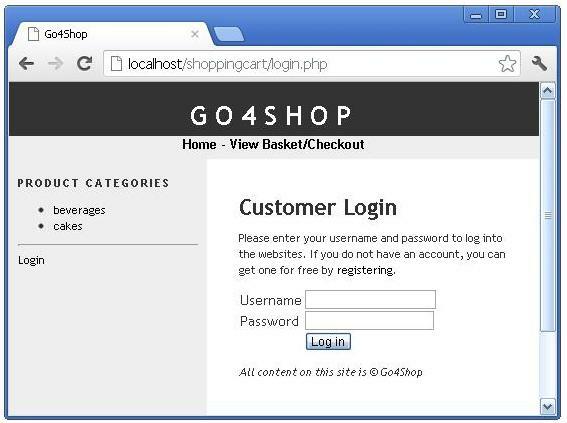 Create a new directory called go4shop and add the code shown in Example 1 to config.php. 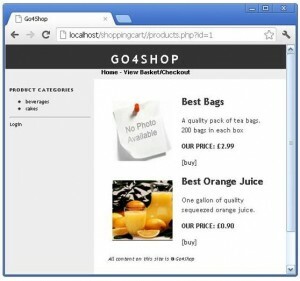 Example 2.Create header.php as shown in Example 2. EXAMPLE 2 The header file adds the menu options, includes the sidebar, and adds some login/logout links. ■ At the top of the file, a check is made for a session variable called SESS_CHANGEID. If it exists, the session is unset (deleted) and the session id is regenerated. Later, when the order is complete, SESS_CHANGEID is created when the session system should be reset. ■ A check is made to see if the SESS_LOGGEDIN variable exists. If it does, it indicates the user is currently logged in, and his username and a Logout link are displayed. The username is stored in SESS_USERNAME; this variable is created in login.php, which is covered later. ■ Create css /stylesheet.css file for our shopping cart overall design shown in Example 3. ■ A file called bar.php is also included in the header file. This file contains the list of categories shown in Example 4. EXAMPLE 4 Although the code in bar.php could have been added to header.php, you can use this file to cleanly add other content if needed. The code in bar.php performs a SELECT query to gather all the categories and display them in an unordered list. Each category links to products.php, which is created later. Create footer.php and add the code shown in Example 5. EXAMPLE 5 The footer file adds admin links when the administrator is logged in. Create the main index.php for site, using the code shown in Example 6. EXAMPLE 6 It may come as a surprise to see such a minimal index.php file. This file is really intended for generic information about the store. </strong> website. Click on one of the pages to explore the site. We have a wide range of different products available. With the main design complete, your browser should display something similar to Figure 2. Users are a critical element in a shopping cart, and tracking both registered and unregistered users is important. Many of the different scripts that form the site have two strands of functionality: one if the user is logged in and one if not. Please enter your username and password to log into the websites. If you do not have an account, you can get one for free by <a href="register.php">registering</a>. A check is made to see if the user is already logged in. If so, there is no point in loading the login page, so the page redirects to the base URL of the site. ■ SESS_LOGGEDIN. Set to 1 to indicate the user is currently logged in. ■ SESS_USERNAME. Contains the username of the user. ■ SESS_USERID. Contains the id of the user. In addition to these variables, a SELECT statement pulls the id from the orders table, in which the customer_id field matches the id of the current user. Another session variable called SESS_ORDERNUM is then set to the id returned from this query. ■ No order exists. If no order exists in the orders table, SESS_ORDERNUM is not set to anything. ■ An order exists. If an id is returned from the query, SESS_ORDERNUM is set to this id. This is useful if the user was selecting items for the shopping cart and then logged out. When the user logs in again, the shopping cart contains the same items from the previous visit and the user can continue to select items. This functionality provides some important continuity. When the form is successfully submitted and the session variables are set, the page redirects to the base URL of the site. The page will display the text Logged in as in the sidebar. The completed results should look similar to the page shown in Figure 3. ■ The user clicks a product category to view available products. To choose a product, she clicks the Buy link. ■ Next, the user selects the quantity of items. ■ The page displays the current contents of the shopping cart and total price. The user can also click the X symbols to delete any items from the cart and recalculate the total. The first step in this process is to display the available products within a category. For this project, you should also create some product images, such as those shown in Figure 4, for use with your shopping cart. You need to create at least one image, called dummy.jpg in your productimages folder, that can be loaded when no image exists for a product. 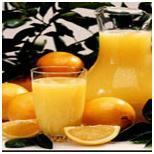 If you used the sample data earlier in this chapter, the image for the Best Orange Juice product is called bestorangejuice.jpg in your productimages folder. FIGURE 4 Each image should be 150×150 in size and saved as a JPG. The pf_validate_number() function validates the category id GET variable that is passed to the page. If no id GET variable exists, the function redirects to the site’s base URL. The information about each product is displayed, and a Buy link is linked to addtobasket.php. The link also passes the id of the product as a GET variable. The completed results should look similar to the page shown in Figure 5.
i got error with this.. can you help me? its line 27 im sorry. I am also getting the same error…..
did anyone figure it out..
First i wanna thank for the great tutorial Mr Masoud. anyone know admin login id and password? remove decryption part in lodin.php (sha1) and in database modify login table with your own password. I would really appreciate if you could get your help on this. hi masud alam, how to login to admin? what is the id and password for admin login? Hey, nice post and nice blog! Can you create a shopping cart object oriented? When I run the project (localhost/go4shop). It gave me lot of errors. 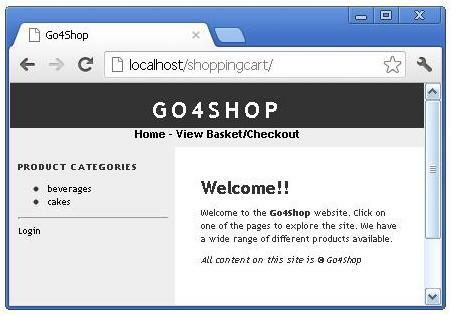 Which I rectified, but I found that some files are missed out in this tutorial like (‘showcart.php’, ‘addtobasket.php’). If you can, please provide me with the files. Sorry i have done some mistake in asking question. I am getting some error during data insertion in table customers. i need this code for my website. plzz help me ! Thank you for making this tutorial available to us. Also we would appreciate if you can make available for download the files used in this tutorial, as when following this tutorial and the next tutorial to complete the project; I am getting a lot of errors and I am unable to correct all of them. Trying to get this cart to work from the instructions and I keep coming across issues with the connections/ showing of the results of tables info due to "
Some serious issues, but fixed all of them, also noticed some unnescary code, alot of the includes for config.php can be delete, also sessions() aren’t used in PHP 5.4 anymore. But once all of it is working, its a good little system. Im working to expand this and bring it up to date, i got a fully working system now. hi.. do you have the missing register.php file? Hi, did you ever get a copy of the register page? Could you please tell me where to add the admin login link ? footer file will show the admin related links only after admin get logged in. I dont see any link calling the admin login file. Could you please tell me how to add an update for product stock that have sold? Could you please tell me how to update the stock product when admin has confirm the payment? please help me for linking the login to login.php..
… It doesn’t display the product table .. So please help me..
Hi, login.php line #37 broken linkregistering. hi. i am using a hosting company and they dont provide a database. can i use sql server 2008. The reason i am using the hosting company site creator. Can i have the register.php file?? because it’s missing 🙂 thank you..
There’s missing register.php file.Can i get the file?.My mail id is sami.cse.1112@gmail.com. Could you please send file “register.php”? It is missing from the project code. Thanks for the awesome Helpful…. I’m looking for the register.php page code, anyone have it? Thanks for the tutorial. It’s very helpful. but I’m looking for the register.php page code, anyone have it? Salam, I have a question. I have set up the code and database in my laptop properly.However , I cannot login into the website as admin. Can someone answer me? Please could i have a copy of the register.php file please? I also need the copy of register.php. can you please send me the register.php file. What is the admin I’d and password? I’m glad to find so many useful information right here within the post, we’d like work out extra techniques on this regard, thank you for sharing. I hv a register.php file.. Anyone know the admin login ID n password? Molimo Vas unesite Vaš username i password kako biste se resgistrovali. Molimo Vas unesite Vaš username i password kako biste se registrovali. Thank you for the source code of registered users. How can I make non-registered users buy products from site? The login.php and the adminlogin.php do not work even if you have entered the correct accurate data from the database to login in. i entered the correct details from the database and It still does not work. It keeps saying “Incorrect username/password” even if i entered the exact data from the database. Please help?